Motorola is rebooting its long-dormant Motorola Razr brand this year, which was a household name in the mid-00s at the height of the popularity of flip-phones. 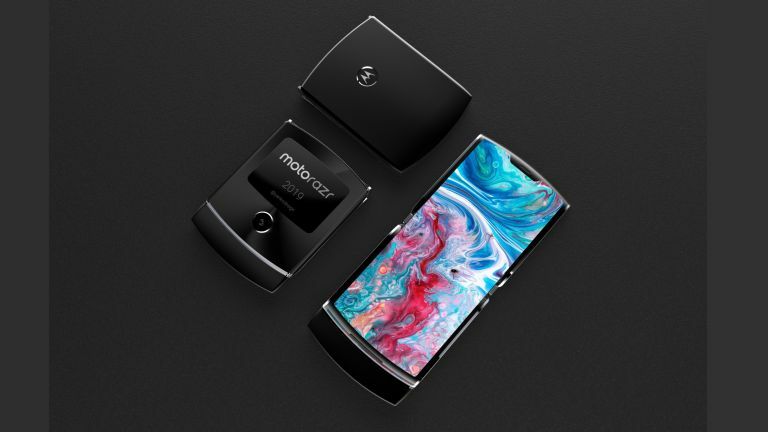 Most recently, in mid-April 2019, the new Motorola Razr was officially confirmed as existing and indeed called the "Motorola Razr" in an official Bluetooth certification body listing, which also confirmed that the phone would use Bluetooth 5.0 technology. The re-imagined handset has been rumoured to be incoming ever since the hugely-successful relaunch of the Nokia 3310 two years ago, and will purportedly combine the hinged design of the original 2004 flip-phone with a folding OLED display. Plenty of information about the next-generation Motorola Razr has already landed, so read on to get up to speed on one of this year's biggest folding phones. We'll keep this article updated with every whisper, leak or educated guess that we hear, too. Stay tuned. According to a report from GSM Arena, the new Motorola Razr will be exclusive to US mobile carrier Verizon, with only 200,000 units available. It's currently unclear whether the phone will even make to store shelves outside of the United States. As for when we'll be able to clap eyes on this long-rumoured foldable phone, Motorola VP Dan Dery says the company wants to gets its flexible device into customers' hands "no later" than its rivals. Given that the Samsung Galaxy Fold is set to launch on April 26 in the United States and May 3, 2019 in the UK and Europe, while the Huawei Mate X is tipped to launch worldwide sometime in mid-2019, that means we'd expect to see something from Motorola before summer. In the unusually candid chat with Engadget, the technology company confirmed that it's already working on a device with a pliable display and that it has "no intention of coming later than everybody else in the market". Motorola Vice President of Global Product Dan Dery added: "We started to work on foldables a long time ago, and we have been doing a lot of iteration." Open up the new Motorola Razr and you'll be able to see just how much has changed. According to the patent schematics and rumours from the supply chain, the new Razr will have a foldable OLED display that runs the length of the handset. While the Razr will still have a hinge, it will be hidden from view by the pliable display whenever you're using the smartphone. When the rebooted smartphone is open, it is expected to have an expansive screen with a widescreen aspect ratio so that you can watch the latest blockbusters without any of those troublesome black bars. According to the latest report from XDA Developers, this external screen will not be able to run every Android app installed on your smartphone. Instead, Motorola is believed to be limiting the touchscreen to a select few system apps, like Moto Display, Moto Actions, and the Moto Camera app. That is a very different approach to the Samsung Galaxy Fold, which treats its 4.6-inch so-called Cover Display as a traditional smartphone screen that runs anything the larger folding screen can – albeit it's limited to two app multi-tasking, not three like the 7.3-inch Flex Display. As well as core system apps, the external display on the Motorola Razr can be used to show up to six Quick Settings tiles. These will be similar to those in the dropdown available at the top of the display on all Android smartphones and will allow users to quickly toggle Airplane mode and the like without interrupting whatever they're doing on the main screen. According to XDA Developers, it’s unclear whether Motorola will allow users to scroll to see more than the six tiles displayed on the screen at any one time. Elsewhere, whenever the Google Assistant is triggered with the wake phrase "OK, Google" or "Hey Google" while the Razr is flipped close, the Assistant animation will be shown on the external display to notify users that the handset has heard the command. This option can be disabled in the settings, in which case the user will simply be prompted to “flip open to unlock” with a passcode, pattern or PIN. Apparently, Motorola also experimented with putting the folding screen on the outside of the device (as in this concept video) but the company seems to have abandoned that approach. When asked whether the product would be similar to the Huawei Mate X design, which has the foldable screen on the outside of the device, Motorola's Dan Dery said: "We have been testing a plastic OLED device with plastic film on top. The fact that you're touching [that kind of display] with your nails is scratching it. It has a short life right away; it starts dying the day you unpack it. But it's beautiful. That first day, it's beautiful." Although this chipset does support Qualcomm's Quick Charge 4+ technology, we don’t yet know what kind of fast charging the Motorola Razr will offer. However, we do know that Motorola will kit out its bendy blower with a 2,730mAh battery cell. That's significantly smaller than the battery in the Mate X and Galaxy Fold. However, the Motorola Razr is a smaller device, so shouldn't have a negative impact on the battery life of the handset. We can't believe Motorola would fit its flagship foldable with anything other than all-day battery life, especially given its emphasis on battery with the recent Moto G7 series.